The Bisserov Sisters, Lyubimka, Neda and Mitra, were born in Pirin village, situated high in the Pirin mountains in South West Bulgaria. They have been singing together since childhood, and made their official debut in 1978. Since then they have performed their repertoire of both acapella and accompanied traditional songs to audiences all over the world. 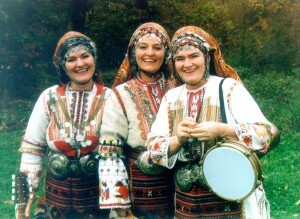 The sisters perform in traditional Pirin costume and accompany themselves on Bulgarian tambura (lute), tarambuka (vase drum) and daire (tambourine).